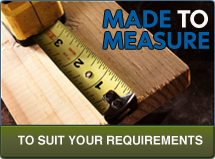 No matter how small or large your building requirements, we can make it! So long as you can provide us with a sketch we can provide a quote to meet your needs. Our sheds are made by highly skilled craftsmen with over 40 years worth of experience, including an experienced joiner. We can make the roof with three angles, and make the shed with sides that are not even. We can install the shed at our factory to ensure that it meets your needs, mark out where the sections go to help you and then take it down again. If you would like to know more about our installation services, please click here.